Hogan line: Eagle Mills Jct.-West Wye Jct. & East Wye. Jct. The LS&I and WC have joint-trackage on the Republic sub from LS&I Jct. in Negaunee to Landing Jct. in Ishpeming. In return, the CN/WC has trackage rights over the LS&I Tilden line from Eagle Mills-Empire Mine, and the Republic sub from Ishpeming-Humboldt. The CN/WC's: Partridge yard, PPE Y tracks, Hogan line, and the entire Republic sub are under control of the LS&I operator. Both companies share maitenance on the joint-track section of the Republic sub. The SORE jobs from Escanaba to the Empire and back run typically as follows, SORE 1 (Tilden to Algoma loads, Misc. Freight, Extra Jennies) on duty around 0700 to 0900 and leaves Escanaba around 1000. Freight and Vans (3 bay hoppers) to Eagle Mills, while any freight for L540 remains at Partridge. Any jennies are loaded at the Empire, and then when the LS&I brings out the Vans loaded, they leave them at Partridge, and SORE 1 gathers those and heads out. SORE 2 on duty at 1500 and up to Marquette around 1700-1800 loads 54-108 jennies. They often times brings up L540's engine(s) for the week...and takes them back on the weekend. L540 is the Ishpeming local, on duty around 0700...varies. They often start their day going to Partridge to switch out any freight SORE 1 may have left, then back to Ishpeming to switch their freight and head to L'Anse. Usually get their CN warrant from Humboldt to L'Anse at around 1000. Works Celotex in L'Anse, as well as a few pulpwood landings along the route. Often times ties up before Ishpeming, but when they make it in, typically around 1800 and if they didn't run out of time, they somedays bring freight to Winthrop JCT for the Mineral Range to use. SORE 1, 2, and 3 are all the WC ore hauls between Empire Mine and Escanaba docks. SORE 1 also hauls empties and loads from the Tilden Mine to Algoma Steel in Sault Ste. Maire. SORE 1 is south and north bound. SORE 1 hauls the Ishpeming freight. Usually SORE 2 and 3 are ore jennies from the Empire and Tilden Mines. SORE 1 is usually on duty around 0700+, SORE 2 around 1500 or 2000 and I think SORE 3 around 2000-2200. L539 Escanaba to LP Sawyer mill, on duty 0600 or near there. Switch out 6-Yard in Escanaba then up the Ore Sub to Sawyer to switch the LP Mill, and back. Out of Gladstone runs the Tilden Loads to Algoma Steel, and the Tilden Empties come back. Trout Lake and Manistique locals serve Munising Paper and Manistique paper respectively, as well as other minor freight ops and pulpwood. Quinnessec has 2 locals, one serves the Quinnessec Mill, and the other the Niagra Mill, and later in the afternoon, a job runs from Quinnesec to Gladstone. Minorcas I do not know much about, but the ore comes from the Minorca Mine on the Minnesota Range, and runs to Escanaba. In Gladstone, there are 2 different switch Jobs as well, to serve Mead, transfer freight between Gladstone and 6-Yard, and a few other small businesses. Wisconsin Central Transportation. The Company operates approximately 2,760 route of railway serving Wisconsin, Illinois, Minnesota, Michigan's Upper Peninsula and Ontario through its principal operating subsidiaries. The Company serves a competitive market area in the country which demands consistent and high quality train service. The network is divided into 14 main lines and 17 secondary lines. Main lines are those with the heaviest use, while secondary lines provide services to on-line customers. The Company also provides wholesale freight haulage services for carload and bulk commodity trains between Superior, Wisconsin and Chicago. The Company's railroad operations are subject to competition from trucks, other rail carriers and lake vessels. The Company's International business is conducted through affiliates located in the United Kingdom, New Zealand and Australia. Freight accounted for 85% of 2000 revenues and other 15%. 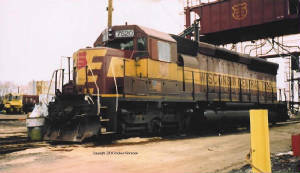 The Wisconsin Central Ltd., also serves the northern midwest U.S. and Ontario, Canada; also manages rail operations in the U.K.
and Australia, and manages rail and ferry operations in New Zealand.